When you think of inspiring heroes in the modern world, Muhammad Ali may be the first person to come to mind. Ali spent over 30 years advocating for Parkinson’s disease and helped raise millions of dollars for foundations and organizations dedicated to finding a cure. In doing so, he became an inspiration to those with the disease and their caregivers in Oshkosh. Growing up in Louisville, KY, he always knew that he would one day make a difference. After turning to boxing as a way to escape the poverty around him, he discovered that he had a talent for the sport. His long line of successes in the ring included an Olympic gold medal and several major trophies and awards. Though he loved his fans, Ali wanted them to view him as just a normal guy. Though Ali announced his diagnosis in 1984, he spent a little time before that out of the limelight. Unlike other celebrities who lent their names to organizations, Ali originally thought fans might look at him differently after hearing he was sick. It wasn’t until 1984 that he was encouraged by his doctor and his wife to go public. Those around him inspired him to once again become a champion fighter we knew and to show his fans that Parkinson’s was a condition they could help cure. The odds of developing Parkinson’s are fairly low in most people, but it increases dramatically among those who suffered any type of head injury. Ali’s doctors believed that he developed the condition as a result numerous head injuries sustained during his long boxing career. During his time as a Parkinson’s advocate, Ali dedicated his time and energy to spreading Parkinson’s awareness and helping other athletes stay safe in and out of the ring. 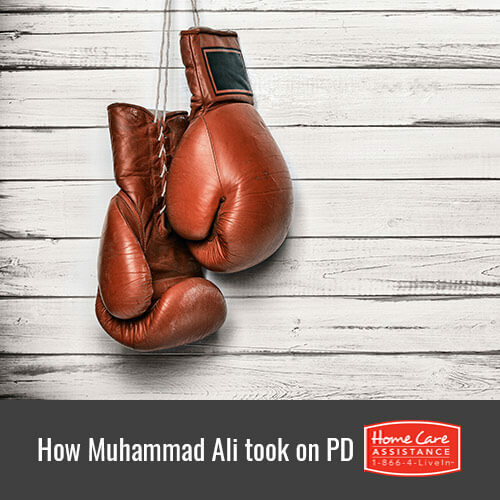 His work led to the opening the Muhammad Ali Parkinson Center in Phoenix, AZ, which continues to provide outreach, support, and treatments for those with PD. Between his career and charity work, there is no disputing that he truly was the greatest. In spite of having Parkinson’s, Muhammad Ali managed to live a full and happy life. He encouraged others with PD to do the same. You can give your loved one the support he or she needs to fight Parkinson’s with help from Oshkosh, WI, Home Care Assistance. We provide comprehensive home care for seniors with PD that encourages them to live as independently as possible while boosting overall wellbeing. To schedule a free consultation, call 920-710-CARE (2273) today and speak with a knowledgeable Care Manager.